There are, and there have been, a multitude of amazing guitarists. Everyone surely has their favourite few, and a lot of people will agree, as guitarist popularity polls will testify, than Eddie van Halen ought to be on number two. But nobody questions who should be on number one. Jimi Hendrix is number one. There has never been a guitarist with his vision, his talent, and his virtually written-for-Hollywood life story. It is odd to realise that Jimi has only been around for four years of successful tours and albums, a time that popular bands these days spend between albums. I reckon that more than a few people consider Hendrix' "Electric Ladyland" to be one of the finest albums of the century, perhaps of the millenium. Although some would perhaps have it that Jimi Hendrix' death helped form the very legend he has become, he definitely died too early. He must have had so much incredible music up his sleeve, it's amazing. Nonetheless, we have to make due with the few studio albums he recorded, as well as the live albums that keep on surfacing. The Hendrix family have kept on releasing albums posthumously, at times with amazingly brilliant efforts among them. One such brilliant efforts is the new "Live at Fillmore East", culled from the same four performances (two on December 31st 1969 and two on January 1st 1970) as the classic "Band of Gypsys" album. Now with Buddy Miles and Billy Cox accompanying him (instead of Noel Redding and Mitch Mitchell who made up the original Experience), these concerts featured a different Hendrix, perhaps more groovy. This was, arguably, the finest line-up ever to perform with Hendrix - they also played at the legendary Woodstock performance with several other guest musicians (the "Woodstock" release, incidentally, is another brilliant Hendrix Family release). "Live at Fillmore East" contains 16 tracks on two CDs. A total of 13 have never before been released on CD, including several that made it on the mediocre vinyl "Band of Gypsys II". Now remastered from the original tapes, these tracks sound excellent too. As a matter of fact, good old Eddie Kramer worked on this double CD and the master's hand can be felt - and heard. This new release if mandatory material for any Hendrix fan. It is at least at a par with other excellent releases such as "Live at Winterland", "Montery" and, of course, "Woodstock". 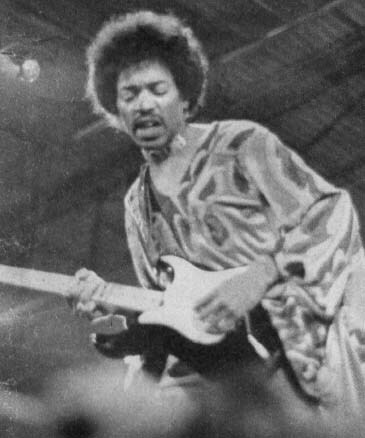 You can just sit back, have your jaw flap open helplessly, and inside feel a little sad for Jimi's untimely demise.